Of course I observed Pi Day (3/14, at least in North America) by eating pie. But this year I also got to perform product testing in order to provide a valuable public service. Because that’s the kind of guy I am. A couple of weeks ago, a fellow by the name of Ken Weikel wrote to say he’d read my old article on Interesting Thing of the Day about pie funnels. Had I, by any chance, heard of his product Pie in a Bottle? And if not, would I like him to send me some to try out? I hadn’t; I would. A few days thereafter I received a box of goodies—apparently the entire Weikel Foods product line—including two jars of Pie in a Bottle. That’s right: Pie in a Bottle isn’t in a bottle, it’s in a jar. The jars came in a box. I received a box of jars of Pie in a Bottle. Just to be clear. Pie in a Bottle is a mixture of corn syrup, sugars, honey, and flavorings. It’s supposed to be a substitute for all the tedious measuring and mixing that would otherwise be required to make pie filling. 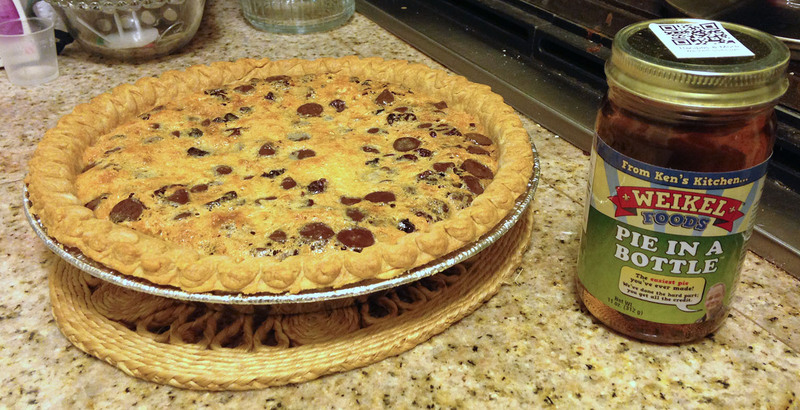 You mix a jar of Pie in a Bottle with two eggs, pour that into a pie crust with a cup and a half of your favorite fillings (dried fruit, nuts, coconut, chocolate chips, whatever), and bake for 35 minutes at 350°F. Let it cool, and voilà: pie. Since I was quite busy today, I lamed out and bought a couple of frozen pie crusts instead of making my own. (I know. Lame.) I decided on a mixture of dark chocolate chips, dried cherries, and shredded coconut. And I have to say, it did indeed take only about 4 minutes to combine all those ingredients and get the pie into the oven. Can’t complain there. The pie was delicious. It really was. I can’t necessarily attribute the deliciousness specifically to the Pie in a Bottle, and to be sure, if I were making my own pie from scratch I would never, ever use corn syrup as an ingredient. BUT. And this is, I think, the whole point: Had it not been for the Pie in a Bottle, I would not have eaten pie on Pi Day. It would have been too much work given my other commitments. So, whatever else you might say about Pie in a Bottle, it does certainly accomplish the fundamental task of bringing pies into existence rapidly. It must be said that this trick doesn’t work universally. Pie in a Bottle won’t help you with a lemon meringue, pumpkin, or cherry pie, for example. I think the optimal usage case is pecan pie, or other nut pies. Still, for pie in a hurry, it’s hard to beat. I’ve done countless interviews for radio shows, newspapers, and podcasts, as well as live presentations of various kinds. But tomorrow, I’ll appear in my first TV interview—on a live broadcast, no less! As I mentioned last week, Take Control Books is donating $1 from every copy of Take Control of Thanksgiving Dinner sold in November to the San Francisco Food Bank. As another part of that effort, I’ll be appearing as a guest on CBS-5’s Eye on the Bay this Tuesday, November 14, at 7:00 p.m. (Pacific time). This episode is a special live broadcast from an Albertson’s supermarket here in San Francisco to promote the Food Bank. If you live in the San Francisco Bay Area, set your TiVo now! I’ll probably be on the air for just a few minutes during the half-hour show, partly to talk about the Food Bank and partly to promote my book (which, in turn, supports the Food Bank). Wish me luck! This week is the annual Take Control fall (in the northern hemisphere) sale. Every ebook is available for half price, which makes for some truly outstanding deals. (Printed books are not on sale, as we have limited control over their pricing.) Just 24 hours into the sale, we’ve already seen some really delightful sales figures. Since I’ve written a dozen of the Take Control titles, I tend to see bigger results than most of the authors, but we’re all thrilled at how nicely the sale is progressing. If you’ve been on the fence about buying one of our ebooks, there’s no better time than now! Go to this special link between now and next Monday, November 13, to take advantage of the special prices. Meanwhile, we’re also running another promotion: For the entire month of November, we’ll donate $1 from the sale of each copy of Take Control of Thanksgiving Dinner to the San Francisco Food Bank. You can make Thanksgiving a less stressful day for yourself and help to feed low-income people at the same time. And, if you make your purchase in the next week, you can make a difference for $5 less! If I’ve counted correctly, I’ve been a guest on Gene Steinberg’s Internet radio show The Tech Night Owl LIVE ten times now. Tonight I appear on the show again, this time to discuss Take Control of Mac OS X Passwords (and a bit about Thanksgiving dinner). Despite the word “LIVE” in the show’s name, the interviews are prerecorded. You can hear a streaming version of the show as it’s broadcast at 6:00–8:00 p.m. Pacific (9:00–11:00 p.m. Eastern, or Friday at 0200 UTC), or download an MP3 recording of the show starting a day or so later. Update: The link to the MP3 file of the show is here.